Image courtesy of car15kokusai: (Photobucket profile). Note that the barrel would be oriented so that the thickest portion of the barrel would be at the top. Note that only 500 pieces were manufactured so they are technically considered collectors' items. Feedback from these kits has been generally positive and results in a flatter trajectory and tighter groupings. Madbull barrels are preferred due to their quality and aluminum construction, making them easier to bend and more resilient to aggressive bends, whereas brass and stainless steel barrels tend to permanently deform. Image courtesy of Clandestine Airsoft. "Long Range Barrels, often abbreviated to LRB, use a slight bend in the barrel to force the BB to the top center of the barrel via centrifugal force. This force prevents BBs from floating and bouncing around the top of the barrel where their spin axis is altered slightly and throws each shot off as the hopup effect curves the BB slightly off course. Once the BB is running on the top centerline of the barrel it continues to acquire more backspin from running along the top of the barrel which means less hopup is needed, which is very important with higher mass rounds. While this LRB could be used alone with no hopup it's designed to be used in combination with an advanced hopup system like the R-hop so the balance between the two can be adjusted to yield max accuracy. In addition to adjusting the LRB bend amount and normal hopup amount you can also adjust the angle of spin by adjusting the balance between the two LRB screws. This allows you to get the spin perfectly vertical with no curving to the side. The last level of adjustment is an adjustable barrel support, a new LRB feature being introduced here, which allows the bend point to be moved up and down the barrel to create either an increasing or decreasing radius bend. These are designed only for use with 455mm barrels since 455mm is commonly accepted as the most accurate length." "Due to the extreme cost, complexity, and labor involved HS5 has decided to discontinue these they are a limited edition." Even better! So we have a cool new old technology to play with but it relies on plastic mounting and adjustment hardware and it doesn't have a threaded muzzle. On top of that, they cost $220.00 each and there are only ten of them out of the open market, two of which have already been sold. I had been earnestly looking forward to the release of this LRB but I was puzzled at why HS5 opted to have the hardware printed out of nylon instead of modifying an existing aluminum or steel outer barrel. Frankly, it pissed me off. In my typical fashion, I began working on a way to make my own and make it better although without the trolling this time around. "The last level of adjustment is an adjustable barrel support, a new LRB feature being introduced here, which allows the bend point to be moved up and down the barrel to create either an increasing or decreasing radius bend." As stated in the manuals for the various EZ-LRB™ manuals and by Cheese Man et al. 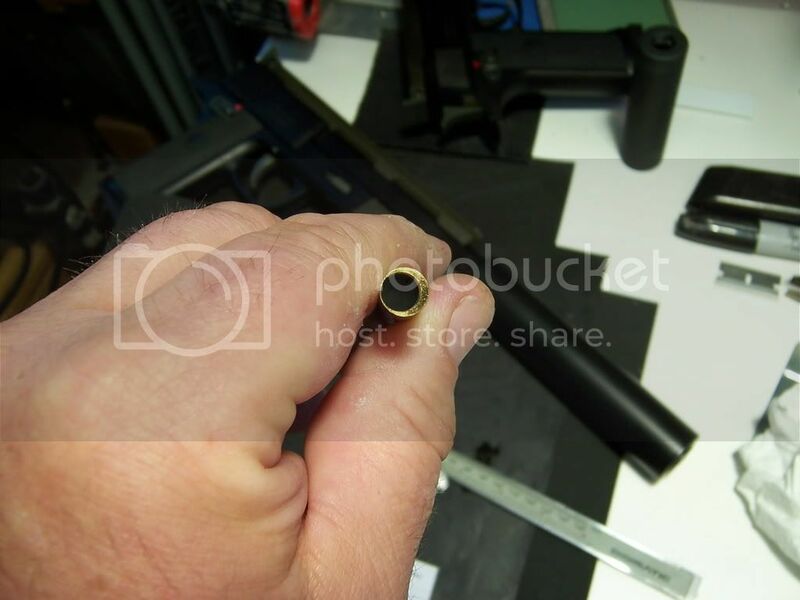 on various forums, the inner barrel must be secured and presumably centered within the outer barrel somewhere between 2/3 and 1/2 of the way down from the muzzle. That adjustable barrel support is likely what is used to lock the inner barrel in place. Now that we have the mechanism figured out, we can begin working on improving it. I decided at the outset of this project that using Shapeways printed parts would be a bad idea. We are dealing with circular and sometimes vaguely circular parts and from personal experience, Shapeways' printers have a difficult time printing circular parts, not to mention they are costly to produce. This is probably a major reason why the HSArmory LRB was deemed too costly and complicated to produce. I have ample access to lathes and limited access to milling machines so the possibilities are practically limitless. I started by selecting some tools to allow me to bore out a scrap Dboys M4 14.5" outer barrel and drill/tap threads into it for adjustment. Following advice given to me from porting inner barrels in the past, I drilled and tapped all the holes into the outer barrel first and ensured they would work with the set screws I planned to use before I went about boring it. By placing the holes 2/3, 1/2, and 1/4 of the way down the barrel from the muzzle, I made a way to lock the barrel in place at 1/3 of the way to the muzzle from the hopup, 1/2 of the way to the muzzle from the hopup, or a combination of the two. Don't whine about the stripped threads. That's why it's a test barrel. A shot down the barrel from where the hopup would sit. Notice the downward sag. This inner barrel has a 1mm bend at the exit but a much greater overall arc because of how it extends past the outer barrel. Great! Now I had a full millimeter of travel from center to experiment with assuming my inner barrel stops right at the end of the outer barrel. The problem was that the effect, while still observable, was barely noticeable and did not coincide with the results others seem to have gotten. After some more research into other DIY LRBs done in the past, I found that 1mm of bend is not sufficient for the muzzle energies we typically play at. Cheese Man stated that most guns need between a 2 and 3mm bend in order to function properly, so I set my sights on 2.5mm, keeping in mind that I could extend the arc beyond that by using an inner barrel longer than the outer barrel. Some have even made adjustments out to 4.5mm possible in BASRs. I needed to extend the length of travel somehow to be able to use a 363mm M4 inner barrel without undermining the 14mm threads or the adjustment screws at the muzzle, so I bored out the first ~2" in from the muzzle to 11.9mm ID. This increased the length of travel from 1mm to 1.65mm, a number still off from my target of at least 2.5mm. It did not seem to affect the integrity of the adjustment screws in any way but it did get even closer to destroying the 14mm muzzle threads. If these barrels actually follow metric thread standards, I can only bore out to 13.133975mm ID before I reach the root of the threads. If I don't breach them altogether, they will be nearly useless and won't be able to support hardly any weight, and even if I bore it out to, say, 13mm ID, I'd only have 2.2mm of travel from center. This is likely why the HSArmory LRB is devoid of muzzle threads. -This is now the best option and the muzzle CAN be re-threaded for larger threads. The outer barrel would have to be shortened or paired with an inner barrel slightly longer than the outer barrel in order for this to work since the inner barrel needs to extend at least halfway through most birdcage M4 flash suppressors in order to work. Otherwise, the BB runs the risk of colliding with the flash suppressor immediately after exit. Mock suppressors can still be used as long as they are short and spacious enough inside for the BB to travel unimpeded. -I've decided to forget about this altogether. The risks outweigh the benefits because if I turn the end of the inner barrel down enough, the adjustment screws might cause it to collapse. -Since options 2 and 4 are off the table, this is no longer an option. Again, these measures are only for the hypothetical situation where I would be required to use an inner barrel the same length as my outer barrel. Any sensible person would choose option 3 and roll with it. Regardless of where I decide to go with this, any and all flash suppressors and mock suppressor adapters need to be bored and/or Dremeled out in order to provide a space for the BB to travel through uninterrupted. This isn't all that hard, all things considered. Feel free to offer up suggestions, criticisms, comments, you name it. If you see any inaccuracies at all, please feel free to let me know as loudly and rudely as possible I'll continually update this as things go along. All images, copyrights, and trademarks are the property of their respective owners. Update: I have decided to completely forgo the 14mm threads and simply bore out the outer barrel as much as possible, at least for regular carbine length barrels. Re-tapping the muzzle for larger threads might be an option later on. Fortunately, I did find a few sources for cheap outer barrels that I can turn down to just about any length I need. Interesting. I have an Asahi M60E3 SDX with a vintage LRB and it indeed CAN shoot 300 ft. Good luck with your experiment. See? You guys had some of the coolest and best-performing toys back before I got into this game and the whole industry has moved away from its old performance standards and settled for a maximum out-of-the-box effective range of ~200'. People **** themselves in amazement when I shoot them at >250' with good conditions and wonder how I managed to pull it off. Most people you ask on he field say that the maximum effective range of almost any AEG is in the neighborhood of 180-230' and that's hardly acceptable compared to what many of the vintage classics can accomplish. I'd love to see and fire one of these things in person. Some performance notes: Even with the relatively limited length of travel, it's working and working well. The characteristics of the LRB effect include tighter groupings, delayed and diminished climb from hopup applied, fewer fliers, and a slight boost in effective range. The BBs travel with a much flatter trajectory and don't need to be over-hopped in order to reach the same ranges as a regular barrel group. I am still somewhat far from my 2.5mm target but it's getting close. From what I understand from others' experiences, the higher the FPS you use, the less added effective range you attain. Groupings should still be tightened regardless but the most noticeable effects are seen when used at lower output levels. Even with my sub-par adjustment limits, my findings are reinforcing these statements. ...are a pain in the *** to bore because 9 times out of 10, the final bore in the end is too wide to pass that sharp shoulder where the OD decreases. As long as you use an aluminum inner barrel, you can get a nice decreasing radius curve out of it but a plain outer barrel will be much better for simplicity's sake. I can then shorten it down to whatever length needed, however, this eliminates the slots for the gas block/front sight post if I shorten it down too far. 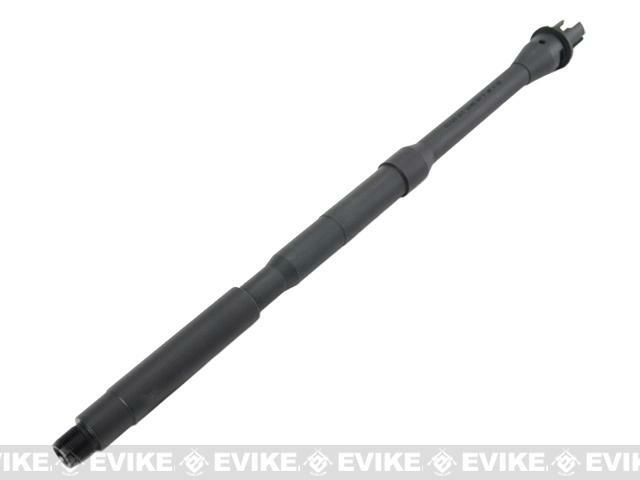 IF I do end up offering this as a product, that JG M16 barrel, provided that it actually looks like the one that's pictured on Evike, would be my go-to barrel of choice. The Madbull outer barrels that are 16" and above look promising, as well. I'm still waiting for some random Chinese outer barrels to arrive to see if I can cut the costs down even more but we'll see where that takes us. I'll be ordering some Madbull inner barrels, one of the JG M16 outer barrels, and maybe even a Madbull 20" barrel. At the moment, I need to order some larger set screws, thumb screws, and taps since I'm stressing the 4-40 screw threads too much as it is. I'm also not getting the range of adjustment I need out of the thumb screws I ordered so those need to be lengthened a bit. Another thing is that the two adjustment screws at the very end of the barrel need to be spaced closer together so that they are centered on the inner barrel when it's within the adjustment range it needs to be in. Overall, I'm very happy with how this little project is progressing. I expected far worse roadblocks than I've encountered and it's looking like I won't be losing anything but cosmetic features by doing this modification. If anyone has any questions or comments, don't be afraid to post them or send them to me. Do you think this is a product you will be selling any time soon? Also will it be a stand alone product or will you also mod customers outer barrels. I'm not entirely sure yet. I still have to get a few more tools and fixtures to be able to accurately lay out and drill the needed holes before I can call this anything more than me screwing around in my spare time. I'd like to be able to offer this to customers as a drop-in item and as a service for you to send your outer barrel in, but there are certain restrictions and limitations imposed by the machinery. Those JG M16 barrels from Evike are PERFECT for this modification, though. Good to hear about the jg barrels. Keep us posted. I wrecked a JG M16 barrel but a buddy of mine had a spare laying around. I've got it to where I can put the kind of bend on it it should need and I skirmished with it this past weekend. The performance was decent - the groupings improved noticeably but I'm lead to believe there are other issues with my hopup that are causing some inaccuracies. I'm waiting on a new Madbull 455mm inner barrel to arrive in the meantime. I now have the layout process down enough that it's repeatable and accurate. I'm thinking of different ways to carve out the space for the inner barrel to flex...maybe broaching would be the best way instead of enlarging the hole and thinning the walls around the entire barrel.